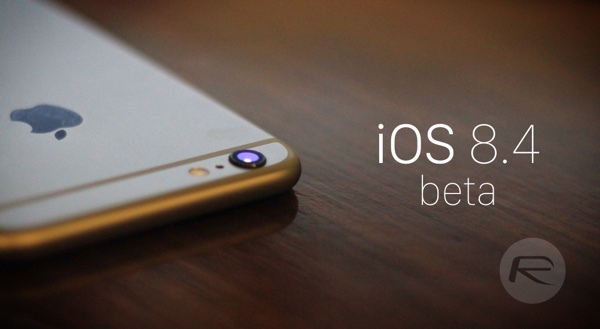 iOS 8.4 beta 4 download for iPhone, iPad and iPod touch has just gone live. The new beta is available for registered members of Apple Developer Program. It was just yesterday when Apple introduced us to the much-anticipated release of its mobile operating system – iOS 9, consequently rolling out the first beta right after the opening keynote of WWDC 2015. While iOS 9 is due for consumer release somewhere this fall, Apple is fast tracking to iOS 8.4, with its fourth beta released just today. Carrying a build number of 12H4125a, the release will be available to existing iOS 8.4 beta users as an over the-air download, while new users can simply grab the pre-release OS through the Apple Developer Program. If you’re wondering what’s new with this build, well, nothing much really, other than performance improvements and bug fixes over the third iOS 8.4 beta that came out almost a month back. In fact, iOS 8.4 as a whole only brings one notable change to the table, and that is to lay the foundations for a brand new Music app, which will play home to Cupertino’s shiny Apple Music streaming service, which also saw an announcement just yesterday. Apple Music is not available for anyone just yet, as the Cupertino giant plans to include this with the final release of iOS 8.4 which will see the light on the 30th of June. Apple has announced that the music service will have a subscription fee of $9.99 / month but it will be offering users a free trial for the first three months of use. Even more interestingly, Beats Music subscribers will be able to move their subscription over to Apple Music. And to sweeten the entire deal, Apple is also throwing in a family plan into the mix, in which 6 people can share a single Apple Music account for a flat fee of $14.99 a month, making it a highly appealing streaming service right out the door. Like we mentioned before, if you are already on a beta build of iOS 8.4, go to Settings > General > Software Update on your device to update over-the-air. Alternatively you can also grab the direct download link from download section of Apple Developer website. Are we loosing then, Apple Radio in the Music app? there is a new Music app in 8.4, just not same as iOS 9.